Titania Jordan has become the face of technology in Atlanta. (Quite literally.) 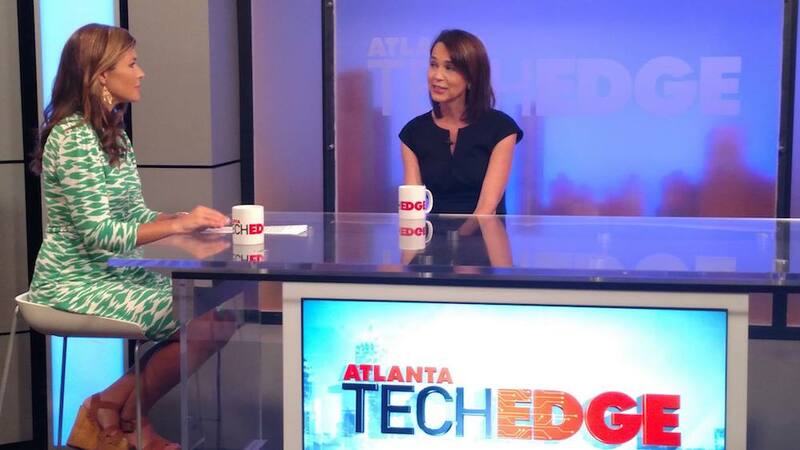 As the host of the Atlanta Tech Edge, a news program on 11Alive, she showcases the innovation happening in the city each and every week. Within this spotlight, she has emerged as a fixture in the tech community, serving as a mentor, panelist and occasional emcee. Jordan’s experience extends much further than the teleprompter. The tech veteran has had an impressive career, which includes leadership as the former Chief Marketing Officer of KidsLink, founder of Privet App, marketing adviser to Hirewire, and adviser and Chief Parenting Officer of Techstars’ startup, Bark. Now, Jordan is leveraging her passion for technology as the new Executive Director of Band of Coders Girls Academy, a coding program for preteen girls. Jordan shares about transforming her life from the throes of postpartum depression to becoming a startup superstar and why she will forever champion fellow women in tech. What draws you into technology and entrepreneurship? What draws me into technology and entrepreneurship is the fact that anything is possible. If you can dream it, you can have it. There are no rules, there are no boxes. In fact, it behooves one to think outside of the box. That is how you stand out and become a success. I’m a “glass-half-full” type of person, which sounds so cheesy, but it’s really how I am. Sometimes I’m actually more of a “glass-over-filling” type of person. Bottom line: I am eternally optimistic. If there is a chance that anything can happen, I am going to hold onto that hope and work my tail off to make it happen. Mix that with an entrepreneurial spirit and therein lies my essence. Thankfully, the technology aspect keeps me balanced. You can’t drink too much of your own Kool-Aid. If you become too insulated by your reality-distortion field, you can lose a lot of money and a lot of time. Science will help keep your dreams in check. I think that is the fruit of the beautiful marriage between entrepreneurship and technology- a distorted reality merging with solid data to make crazy (awesome) things happen. How is that attitude applied to your current activities, including your mentorship roles with Techstars and others? Techstars, man! Michael, Tyler, Rachel…the whole team is amazing. They do startups right. Techstars is such a powerful organization for the city. It is global, it is insane, and I love it. The fact that 90% of startups fail, yet 90% of the startups that go through the Techstars program are either still active or acquired, blows me away. Coming in and working with Pat at Real Meal Delivery was solid; I love his concept and his team. Also, most recently, I have the honor of working with Bark.us, which helps keep children safe online. Tell us about your involvement with startup, Bark. Yes! I am so honored to serve as Bark’s Chief Parent Officer. To be honest, I’m terrified for this next generation of tweens and teens. I have a seven year-old, and very soon he will be able to access that big bad world known as the internet we all know and (usually) love. The fact that there is now a technology that can monitor and analyze conversations using machine-learning algorithms, flag issues immediately, and alert me via email or text that my son is engaged in sexting, cyberbullying, or contemplating suicide is huge. It’s life-changing. Technology is arguably the biggest concern for parents today. Texting phrases and acronyms are constantly changing. Parents might not know that “Netflix and chill” means hooking up, they think, Oh, they are going to watch a movie, oh how sweet. Plus, there is no way we as parents have the time to read every email, scan every text message, and follow every social network. It is really, really cool what the team at Bark is doing by automating that process for parents and giving teens and tweens a sense of privacy they deserve. My hope is that this next generation navigates social media wisely with our help and insights. I love social media, yet I am so very thankful it wasn’t around when I was a teenager. There seems to be a theme centered on working with younger generations, including your new role with Band of Coders. I am over the moon stoked about my new role at Band of Coders, which is a software development firm that is passionate about supporting women and minorities in technology. I serve as the Executive Director of Band of Coders Girls Academy. These girls that come in are sparkling bright stars that have yet to be jaded by the imposter syndrome that I know too well, or the general discrimination that seems to be a societal theme. They are at that age where they think they can do anything. And they absolutely can. When I was 8, I thought I could be an astronaut or oncologist. I thought I could totally do that. Then I grew up and realized that I wasn’t so great at physics or chemistry. At a certain age in high school, many young women lose that sense that anything is possible. The girls who come to Band of Coders Girls Academy are on fire. They are so interested in computer science and what technology can do for the issues that matter to them. So, we encourage and empower them at that ripe moment and show them that they can do and be anything. By high school, less than 1% of girls are studying computer science. That is major. Women make something like 70% percent of what make men make in general. That wage gap is even greater in the tech industry. This is completely ridiculous, as it is the year 2017. The tech industry always has jobs, and it pays about 15% above average, and women are being failed in an economic sector that can really empower them and change the world. At the Band of Coders Girls Academy, we inspire the next generation to know what they can do, to know that STEM and STEAM initiatives are fun and fruitful. There are social good components, there are design components. Tech isn’t just about being an engineer; there is so much too it. According to Google, “Encouragement from adults and peers is the #1 contributor to a teen girl’s decision to pursue Computer Science.” That is our why right there. How has your perspective as a female in tech evolved? It’s constantly evolving and for that I am grateful. There was a time in my life when I would look at apps and be like, “These are really cool. I wish I could make an app like that…but how?” Flash-forward five years, and I’ve done it. I didn’t even have to write a single line of code to do it. It is about having a desire, about having a dream. It is about standing up and not letting conventional standards dissuade you from what is possible. Now, I am really, really excited about getting more women in tech. The more of us, the better. You are a visible leader for women in technology in Atlanta. Can you speak to assuming that role? That is so strange to hear, because I’m like, what, are you talking to me? It still doesn’t seem real and I am truly thankful for the many wonderful opportunities that have come into my life. As I get more comfortable in my role as the host of the Atlanta Tech Edge, and I work with more and more tech companies both on and off camera, I am beginning to see what impact I can have for the next generation of women in tech and I am so honored to be in this place. It wasn’t too long ago when I was a mom with postpartum depression and a nursing newborn, sitting on my sofa, thinking, what has become of my life? I remember thinking: I worked very hard in school my whole life, I graduated from college, I began a promising career, and, now, I am a mom. I don’t know what to do with myself. What are my unique and employable skills, and how am I going to make money? How can I experience success? I can’t just rely on my husband. I want to give back to this world. I am a smart, passionate, creative, and driven woman, but how do I put that to good use? I feel like there are so many women out there with incredible talents and capabilities, who have felt the same way, who have felt un-empowered. They may not know how to take that first step. So many times I have heard in conversations with women that I have mentored: I didn’t know that I could do that. Once you know that you can do something, once you know that one person believes in you, you’re like, “Oh, my gosh. This is possible.” I think faith comes into it, personally. Time and time again, I have seen God open doors where I only saw walls. I am so passionate about the fact that anyone can do anything with the right support and the right education. It is a matter of fostering them and leveraging their unique talents. Everyone has innate abilities that are unique to them and them alone. Every week, you are able to spotlight tech stories happening around the city. How did you fall into the Atlanta Tech Edge and what is it like? It is amazing and I think that is one of the biggest examples of a door opening and discovering that anything is possible. As the CMO of KidsLink, I was doing a lot of television appearances discussing how to keep children safe online. The position became available at 11Alive, and they asked me to try out. I had never even read a teleprompter before, nor did I get a degree in broadcast journalism. It was a prime example of ‘not knowing that I could.’ But I did. And it has changed my life. I have been able to meet incredible game-changers, from Chris Poelma of NCR, to members of our local government, to leaders like Don Barden and Dominique Wilkins, and have one-on-one, important conversations with them. There is no air of stuffiness. In that moment, we are colleagues, talking about future goals with the hope of impacting the Atlanta tech community in some way, much like Hypepotamus does. Hosting Atlanta Tech Edge and letting people know about the blossoming tech scene here, reminding them that big things are coming out of Atlanta, is the best job ever. In what ways are you excited about the future of Atlanta? We are in an unprecedented time in this city, where the cost to develop new technology is lower than it has ever been. The resources and teams and talent are here. You don’t have to move to Silicon Valley or go to New York. You can do big things right here in our beloved city. Not only that, but there is something to be said for southern hospitality. Atlanta business is going beyond just business. It is helping others, it is paying it forward. The combination of tech talent, prime geographic location, social media innovation, an engaged local government, headquarters of some of the largest companies in the world, a booming music and film industry, the largest airport in the world, some of the best food I’ve ever tasted, and the most amazing, uplifting community make the future of Atlanta a very bright one. I am no longer bound by fears of waking up at 75 and wondering about what could have been. Anything can happen and the time is now.